Learn more about the Lorex 9 Camera Security System with 4 Ultra Wide Angle Cameras and PTZ. Find pricing and answers to common questions. 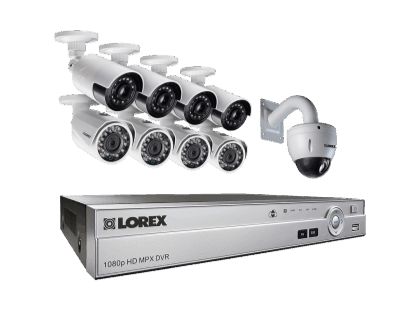 The Lorex 9 Camera Security System with 4 Ultra Wide Angle Cameras and PTZ is a complete security system by Lorex that comes with DV700 HD DVR, four ultra-wide cameras, four LBV2711B cameras, and a 720p HD pan-tilt-zoom camera. Businesses use this system for its HD detail and increased coverage. 1 PTZ + 8 HD 1080p security cameras. Pros: Simple to install and operate. Video is clear, and the night vision good. Cons: Technical support a little slow. Power supply problems. Bottomline: The system is affordable, flexible, user-friendly and feature-rich, with hi-tech surveillance cameras and DVR recording. Very high-quality video. What are some alternatives to the Lorex 9 Camera Security System with 4 Ultra Wide Angle Cameras and PTZ? Wansview Wireless 1080P IP Camera. Where can I buy the Lorex 9 Camera Security System with 4 Ultra Wide Angle Cameras and PTZ security camera system? The system is available on Amazon and on the Lorex website. Does the Lorex 9 Camera Security System with 4 Ultra Wide Angle Cameras and PTZ work at night? The LBV2711B bullet security cameras have a night vision range of up to 130 ft. in low light, and 90 ft. in complete darkness. The LBV2561U super wide-angle security camera has a night vision range of up to 90 ft. in low light, and 60 ft. in total darkness. The LZV1722B PTZ image sensor has only low light capabilities, no night vision. Can the Lorex 9 Camera Security System with 4 Ultra Wide Angle Cameras and PTZ be used in any weather? Yes, all of the cameras can be set up outdoors. They can all withstand dust and heavy rain. The bullet cameras can operate in temperatures of up to 140 degrees, and as low as -20 degrees. The super wide-angle cameras can cope with temperatures of up to 122 degrees, and lows of -4 degrees. And the PTZ image sensor does better in warm weather, handling temperature up to 140 degrees, but no lower than 14 degrees.